The Funky Felter: Funky's Fiber Artist Spotlight on Rudman! A fellow fiber artist and Etsy seller! 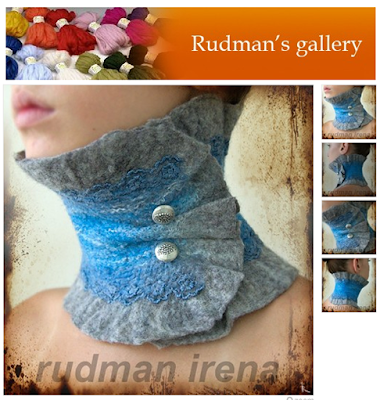 Funky's Fiber Artist Spotlight on Rudman! A fellow fiber artist and Etsy seller! It has been quite a while since I've featured one of my talented fellow fiber artists. It is about time that I let my readers know about this feltmaker. Her shop on Etsy is called Rudman. She's from Ramat Gan, Isreal, and makes absolutely beautiful collars! You can see my favorite example in the photo above. Her collars are simply stunning with gorgeous form and lovely color combinations. I first came across her shop because one of her felted collars was on the front page of Etsy - deservingly so. You can see more of her felted work on her website. She also makes felted toys which are truly unique and adorable! Please check out her shop and browse her websites. I guarantee that you'll find it interesting and inspiring. *The images are screen shots from Rudman's shop on Etsy. **If you'd like to submit a fiber artist (or yourself) for a funky felter spotlight article, just get in touch! And, be on the lookout for upcoming spotlight articles! Wow! Her collars are beautiful!